We arrived on a late flight from Australia with a 7 year old child so glad that the hotel is only 10 minutes away. On arrival, was greeted by James who was very welcoming, friendly and professional. He had us checked in to our room (according to our preferences) in less than 10mins. William then drove us to our pool access room and pointed out all the facilities on the way. Again, he was very friendly and professional. The pool access room is great and definitely worth the extra. Great for kids as it’s not deep and easy access to the main pool and beach. If you want to be closer to the main pool, ask for rooms 0104/0105/0106/0107. All pool access rooms get some sun during the day so you can hang out on your balcony without going to the main pool. Breakfast at the Andaman was very good, a big variety of Western and local. My favourite is the variety of fresh fruit available. I’m now at another resort closer to Patong and it is very much a downgrade from the Marriott. The staff are all so so friendly and always say hello when you walk past. Definitely different to where I am currently staying where the staff are so unfriendly and grumpy and just out to make a buck. Jinny from the Marriott is super friendly and always stops to say hello with a big smile. Location is very quiet, which might not suit some people. There is a small village about 15mins away which has local restaurants (Phens is good) and massages etc. Overall, great stay at a great resort. Definitely recommend. Thanks Marriott, you did not disappoint! There is some noisy construction going on right above the resort. Of course this is not in the control of the resort but there was no information of this provided beforehand. We only got to know of it when we checked in. Some of the rooms are located right below the construction site. Secondly - and maybe this is a seasonal issue - the beach was suitable for swimming only 2-3 hours a day (usually when it was baking hot). Due to low tide most of the day the waterline was wayyyyyyy back (see pics). The positives - very friendly service, very good food, proximity to airport. Nice pool. Frist of all, I need tp say I love this hotel very much. My boyfriend and I stay in this hotel for two nights in Mar. we arrivaled hotel at noon,hotel is soooo beautiful and we really enjoy the good view.and the beach.secound,hotel staff is perfect,Manger Max gave us two cups of drink when we arrivaled, and he.and Molly helped us to check in,they were very nice. There was something wrong when we check in, Max helped us solved the problem in short time,and he even helped us solved the problem our next reservation, that was extra service and personlize service. On the next day, when we come back, we find there was special setting in our room, after check,it was from Max.He knew my boyfriend and I will get married after this trip,.and he did the special treatment for us, it was amazing. Molly in front desk.was very helpful and friendly as well. Third, anout the room, we got a swimming pool view room. we liked our room.We love this hotel very much, not only the beatiful view but hotel good service. I will come back again with my family. My friend and I visited Phuket for the first time and fell in love with this property. We originally booked the hotel for 2 nights and ended up rescheduling our flights to stay 2 more. Staff members went out of their way to ensure an enjoyable experience. We had a minor issue with noise and Rachel, the manager, upgraded us to a Vila with amazing views, beachfront access and our own little pool! The hotel has happy hours from 2 p.m. to 8 p.m. distributed between all the restaurants and bars. The food is amazing at all of them. We truly appreciated how the staff made us feel like we were home. Thanks to Rachel, Grace, Job, Brezee, Kun Phoo, James and Max to mention a few names. We look forward to coming back to Phuket! We got an oceanfront villa for our family and stayed here for 5 nights. The property, the service is immaculate and beyond 5 stars. The property is a bit secluded so not in the hussle bussle of Phuket which is a good or bad thing depends on what you are looking for. For us that was a place and it was almost like a private vacation home with full service. Nai Yang is also far from the party areas in Phuket so we had to take a cab from the hotel back and forth. The onsite restaurant has a great breakfast buffet. The dinner service was a bit pathetic once when they couldn't handle rush at 6pm and took about 45 minutes to get food out. I noticed some guests canceled their orders and left. The manager realized they had some communication issues going on and apologized. The only reason I rated 4/5 and not a 5/5 is the damn lizards. There were lizards all over the property at night making it impossible for us to step out and enjoy the villa. The kids would freak out and one the lizards snuck in our room as well causing total chaos. We also stayed at The Slate nearby for a comparable price - we preferred it in nearly every way. The Marriott was more child-friendly and better for nervous travellers, but I would not recommend it to anybody else over the Slate which was far more stylish, quiet, had better food and better access to outside businesses. The Marriott does have a quieter section of beach - you can walk straight out of the hotel to the water without crossing a road or being subjected to touts trying to sell you horseback rides or cheap beer. There's a quiet restaurant and a small bar made out of a beached longtail nearby, but the beach feels private and is nice and shallow there - safe for kids, swimmable at high tide, neat things to see at low tide. I regret that we ate at Marriott's Big Fish restaurant - the food was terrible at astronomical costs. The breakfast buffet was also poor for the price; worst eggs I've ever had, but a decent selection of pastries and asian dishes. I'd suggest walking 10 minutes down the beach for more options. Our check-in was a bit of a fiasco, with them forgetting about us for 2 hours. We waited in a nice lounge though and they kept bringing us purple koolaid and moist hand towels. The staff were helpful in booking a taxi to the airport but it was expensive (even for phuket) at 650 baht. Our room was nice compared to a hotel in the US, but not notably fancy for a resort. We had a small balcony and pool view which was noisy with children playing. The bottom floor pool-view units back right onto canals so you can hop into the pool from your patio. Other units had private cabanas, and the nicest were private villas right on the beach. We enjoyed exploring the pool canals which run all around the resort. They're shallow and perfect for kids. Stayed here in April 2019 so wanted to put down some good and some things to work on for this hotel. The hotel itself, rooms and grounds are all beautiful and couldn’t fault them. The beach isn’t the best in Thailand but it’s ok. Helpful staff especially Jinny and Kat in the beach bar restaurant. Close to Nai Yang village which is a cool village with bars and places to eat, you can either walk down the beach when the tides out or get in a taxi. Room for improvement This resort is very chilled and relaxed which isn’t always a bad thing but it seriously lacks any kind of atmosphere anywhere in the hotel. Nothing to do in the evening at all, both bars are completely empty even during happy hour. Go to either one of the 2 restaurants at 8 for dinner and you’re likely to be the only table in the restaurant. Once dinner is finished it’s just complete silence everywhere. Appreciate that some do prefer the more relaxed vibe but if you want something to do during the day and evening then this might not be the one for you. Stayed 3 nights, Nice hotel, good amenities. Ate at 2 of the restaurants. Big Fish served a variety of western & Italian dishes. Excellent customer service. Checking-in was absolutely smooth. Daily excellent room service. It was a 5 nights, 6 days beautiful vacation at Marriott Phuket. From the check in, as we were very early, staff offered us to use all the facilities of the hotel, while our room is getting cleaned ready for us. During the day, we were offered non stop replenishing water, freshly cut fruits complimentary. Overall the resort , pool, room, restaurant were very clean. Staff amazing, joyful and very helpful. The small convenience store, close to the main restaurant, is very convenient. There was an international plug in the room, great WiFi connection everywhere in the resort. Good fitness room. Nice Kids club too. I can suggest one thing, if the management consider offering, activity by the pool for kids. It would be interesting for the kids to play some water games with other kids. And a small comment about the paid activity in the kids club, I found it a bit pricy. It was a very good experience in all. Phuket Marriott Resort and Spa, Nai Yang Beach places you next to Nai Yang Beach and within a few miles (5 km) of other popular attractions like Mai Khao Beach. This 180-room, 5-star hotel has 2 outdoor pools along with a full-service spa and 2 restaurants. Enjoy dining at one of 2 onsite restaurants including Andaman Kitchen, which specializes in Thai cuisine. Order from room service to satisfy your hunger without leaving your room. Start each morning with buffet breakfast, available for a fee from 6:30 AM to 11 AM. An LCD TV comes with digital channels, and guests can stay connected with free WiFi. The bathroom offers hair dryers, free toiletries, bathrobes, and slippers. Other standard amenities include a refrigerator, a minibar, and a coffee maker. 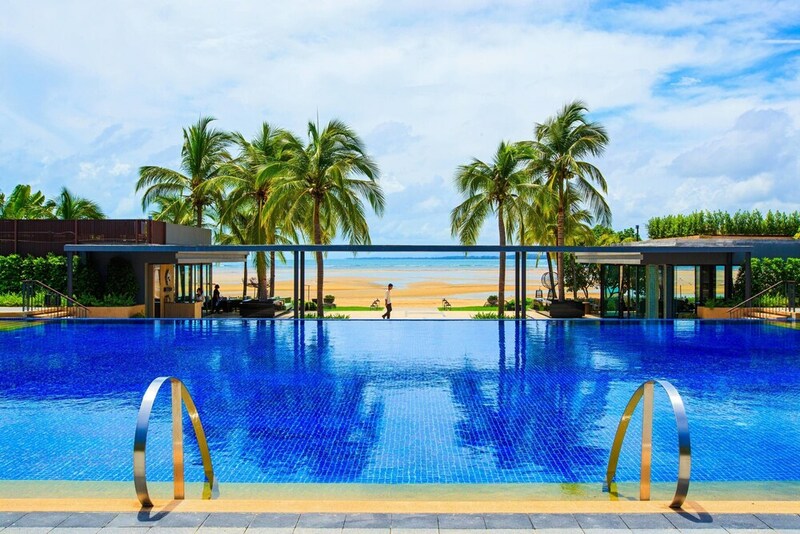 Guests of Phuket Marriott Resort and Spa, Nai Yang Beach have access to a full-service spa, 2 outdoor pools, and a children's pool. If you drive, put free valet parking to good use. Front-desk staff can answer questions 24/7, and assist with luggage storage, securing valuables, and tours or tickets. Other amenities at this beach hotel include a 24-hour fitness center, free WiFi in public areas, and conference space. Andaman Kitchen - Restaurant specializing in Thai cuisine. Open daily. Big Fish - Restaurant specializing in international cuisine. Open daily. The hotel has 2 outdoor swimming pools and a children's pool. Other recreation options include a 24-hour fitness center. The preferred airport is Phuket (HKT-Phuket Intl. ): 7-min drive, 3.2 mi/5.1 km. Reservations need to be made in advance for spa treatments. Contact the hotel at the phone number listed on your booking confirmation.